The Lazy Bear Lodge Has Plenty Of Room For Everyone. 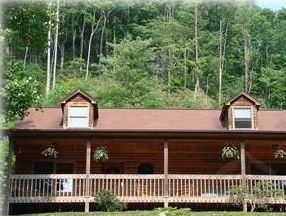 You And Your Family Will Be Comfortable In This 3 Bedroom, 2 1/2 Bath, 2 Story Cabin Home. You'll Enjoy Mountain Views From The Large Front Deck On Rocking Chairs While Watching The Hummingbirds Feed. And When You're Done Having Fun In The Gameroom, Check Out What The Surrounding Area Has To Offer. Play Golf, Visit Roan Mtn. State Park, Linville Caverns & Falls, Blowing Rock, And Boone. Ski Or Visit Sugar Mtn., Beech Mtn. And Banner Elk All Only Minutes Away. Shop In The Antique Stores In Elk Park And Visit Elk River Falls Only Minutes South of The Cabin. The Kitchen Has All Of The Conveniences Of Home. Besides The Basic Refrigerator, Stove, And Dishwasher, The Kitchen Offers New Counter-Top Appliances Which Include Microwave, Coffee-Maker, Bagel/Toaster, And Electric Can Opener. For The Cook That Doesn't Want To Miss A Beat, There Is A Countertop TV. Left Of The Kitchen Is A Large Dining Area With A Foosball Table Included. All Dishware, Glassware, And Utensils Are Provided All You Need To Bring Is The Chef And The Food. The Gameroom Is Sure To Keep You Entertained! It Features A Standard Pool Table. 48 Game Video Arcade, Featuring PacMan, Galaga, Frogger & Donkey Kong. (Quarter Per Play) A Nice Collection Of Board Games Are Available For A Family Fun Night. For The Singer In The Family, A Karaoke Machine With 2 Microphones Will Be Entertaining And Fun. You May Listen To Your Favorite Music On CD's Or Cassette While Playing Pool. Not Enough, A Foosball Table Is Located In The Kitchen! The Master Bedroom Features A King Size Bed, Large Double Closet, Rocking Chair, Cable TV, DVD/VCR Player And Movie Library. The Master Bedroom Also Has A Dresser With A Mirror And A Large Double Door Closet. The Master Bath Includes A Tub/Shower Combo, Vanity Lighting, Double Sink & Heater (For The Colder Months). You Have A Nice View Of The Woods And Pond With The Sounds Of A Small Creek Just Outside The Master Bedroom ! The Breeze Is Refreshing And Serene! The Upper Guest Room Is Charming With A Queen Four Post Colonial Style Bed. Large Dresser With Mirror, Closet , Cable TV, VCR And Movie Library Completes The Room. A Half Bath Is Located Just Outside Your Room. Also, A Small Reading Area, With Book Library, Is Adjacent To The Bedroom.